King Hezekiah of Judah feared that the abundant water flowing outside the city would be used by the Assyrian army. 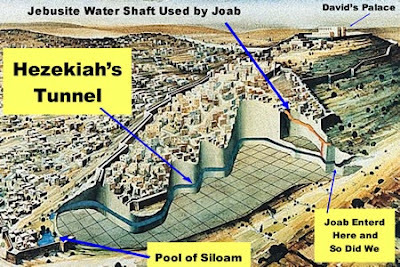 He therefore diverted the water of the Gihon to a tunnel cut through the bedrock. Hezekiah’s tunnel led the water to the Shiloah Pool, built within the walls of the southern part of the city. The winding tunnel was hewn simultaneously from both sides for 533 metres. The difference in height between the source of the spring and the end of the tunnel is a mere 30 cm (an average slope of 0.06%) – a truly amazing feat of engineering. Now the rest of the acts of Hezekiah, and all his might, and how he made the pool, and the conduit, and brought water into the city, are they not written in the book of chronicles of the kings of Judah? In 1913 the French-Jewish archeologist Raymond Weill was commissioned by Baron Edmond de Rothschild to find the tombs of the House of David in the City of David. He uncovered several rock-cut tunnels and caves, that he believed were the remains of the tombs, but the discovery of more lavish burial caves from the 1st Temple period has since cast doubt on this theory. 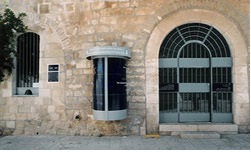 The Ariel center is unique in that it focuses on the study of Jerusalem during the First Temple period. 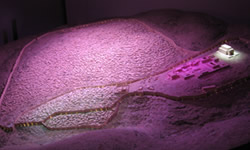 A new model showing Jerusalem towards the end of the First Temple period has been installed at the centre. From a bird's-eye view, the visitor can examine the city's size, the width of the ramparts and gates, to view the Temple and King's palace, generally to instill a sensation of actually walking through the streets and alleys of the city. A new and enthralling multimedia exhibit has been installed next to the model. The presentation portrays an artist attempting to create his life's work by painting Jerusalem. He longs to capture Jerusalem's individuality with his paintbrush, to enlighten the city's secrets with his paints. On his expedition, he encounters characters and events that have left their mark on the generations. 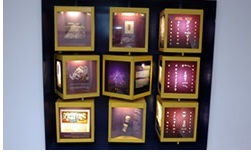 Other exhibits in the center include: A permanent exhibition of artifacts illustrating everyday life in Jerusalem during the First Temple period - models, displays and reproductions of archeological findings such as Sennacherib's sawmill, the Siloam inscription, a silver plaque engraved with the Priests' blessing, a burial cave, jewelry and more. "Bird in a Cage" – the story of the Assyrian siege of Jerusalem, the drama that determined the city's destiny, its character and its status for thousands of years. The Assyrian relief maps, the Bible verses, the official reports of the Assyrian king and the archeological findings join together to paint a full and fascinating picture of that epoch. In addition, a portion of Hezekiah's tunnel has been restored in the centre. 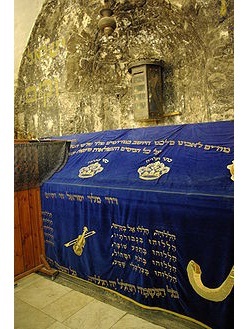 David's Tomb is a site traditionally viewed as the burial place of David, King of Israel. It is located on Mount Zion in Jerusalem, near the Hagia Maria Sion Abbey. The tomb is situated in a ground floor corner of the remains of the former Hagia Zion, a Byzantine church; the upper floor of the same building has traditionally been viewed as the Cenacle of Jesus. 1335, the church became a Franciscan monastery, but, due to tensions with the Greek Orthodox Patriarch, the monastery was closed in 1551 and ownership of the site was transferred to a Muslim family. The site was apparently not viewed as David's Tomb until the 12th century. According to Benjamin of Tudela, writing about 1173, the tomb was discovered during repairs to the church; the motivation for it being declared to be the tomb of David is uncertain. It is impossible to verify whether the tomb is original to the location, as Crusaders removed the tomb from its earlier context, and placed within it a stone sarcophagus, newly built for the purpose; the sarcophagus now rests over a 14th century floor. After the 1948 Arab–Israeli War, it fell on the Israel side of the Green Line. Between 1948 and 1967 the Old City was occupied by Jordan, which barred entry to Jews even for the purpose of praying at Jewish holy sites. The closest accessible site to the site of the ancient Jewish Temple was Mount Zion. Jewish pilgrims from around the country and the world went to David's Tomb and climbed to the rooftop to pray. Since 1949, a blue cloth, with basic modernist ornamentation, has been placed over the sarcophagus. The building is now part of the Diaspora yeshiva. The authenticity of the site has been challenged on several grounds. According to the Bible, David was actually buried within the City of David together with his forefathers. In contrast, the 4th century Pilgrim of Bordeaux reports that he discovered David to be buried in Bethlehem, in a vault that also contained the tombs of Ezekiel, Jesse, Solomon, Job, and Asaph, with those names carved into the tomb walls. 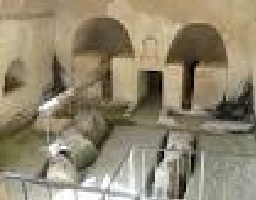 Archaeologists, doubting the Mount Zion location and favouring the biblical account, have since the early 20th century sought the actual tomb in the City of David area. In 1913, Raymond Weill found eight elaborate tombs at the south of the City of David, which archaeologists have subsequently interpreted as strong candidates for the burial locations of the former kings of the city. 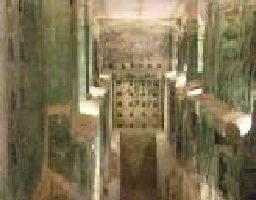 Hershel Shanks, for example, argues that the most ornate of these (officially labelled T1) is precisely where one would expect to find the burial site mentioned in the Bible. Among those who agree with the academic and archaeological assessment of the Mount Zion site, some believe it actually is the tomb of a later king, possibly Manasseh, who is described in the Bible as being buried in the Garden of the King rather than in the City of David like his predecessors. Jerusalem is said to have begun some 3,000 years ago, when David conquered a narrow hill south of today’s Old City, making it the capital and spiritual center of Israel. 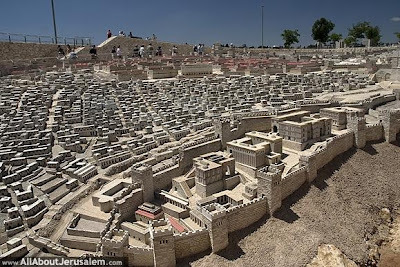 The City of David, the ancient nucleus of Jerusalem, is located outside the walls of the present day Old City, on a narrow spur south of the Temple Mount, surrounded on all sides by valleys, near the Gihon Spring that was its liquid lifeline. Settlement in the City of David began as early as prehistoric times, as attested by potsherds dating back more than 5,000 years to the Chalcolithic period. In the Early Bronze Age the village that stood here took on an urban aspect. It became a small but significant city in the Middle Bronze Age, the time of the Patriarchs, surrounded by walls and extending over about 50 dunams (approximately 12 acres). Jerusalem is believed to be Shalem, the city where, according to Genesis 14, the encounter took place between Abraham and King Melchizedek of Shalem. According to Joshua and Judges, Jerusalem was not conquered by the Israelite tribes, and remained an enclave of a people called the Jebusites between Judah and Benjamin. David's rise to power and his political policies resulted in Jerusalem becoming the center of the Jewish people. After David reigned for a short time in Hebron, he conquered Jerusalem in around 1000 BCE , making it his capital and transforming it into a spiritual center by bringing the Ark of the Covenant there. David's son Solomon finished what his father started, building the Temple and a royal palace. Despite David's and Solomon's efforts to make Jerusalem a unifying factor, the kingdom split and the city remained the capital of Judah only. Judah's relations with its neighbors flourished, brining prosperity to the city, as well as foreign cultural influences. The House of David continued to rule for 500 years, but according to the Bible, the power of the city frequently waned. In 586 BCE, the Babylonians conquered the city, destroying it after a lengthy siege. 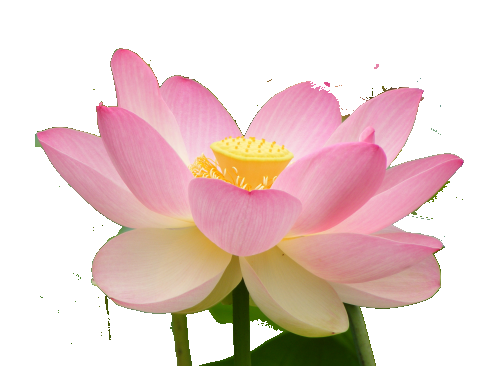 "…came Nebuzaradan the captain of the guard, a servant of the king of Babylon, unto Jerusalem. And he burnt the house of the LORD, and the king's house; and all the houses of Jerusalem…(2 Kings 25:8). The period of the Return to Zion (late 6th century BCE) say the renewal of Jewish settlement in Jerusalem and the rebuilding of the temple. As the city spread, the location of the original City of David was forgotten. Toward the end of the Ottoman period, Jewish settlement on the hill was renewed when the Meyuhas family built their home there in 1873. A few years later, in 1885, a large group of Yemenite Jews settled in the village of Kfar Hashiloah, which they established next to the Arab village of Silwan. When archaeological exploration of Jerusalem began in the last 19th century, discoveries on the hill led to its identification as the ancient core of the city. Scholars and archaeological expeditions from all over the world flocked to the site, which soon became the most excavated mount in the history of archaeology. The large stone structure – the remains of David’s Palace? And Hirma king of Tyre sent messengers to David, and cedar-trees, and carpenters, and masons; and they built David a house. In 2005 remains of what became known as the “Large stone structure” were discovered beneath ruins from the 2nd Temple and Byzantine periods. Mainly visible in the excavation are the fieldstones that served as the foundation of this large structure; its upper stories have not survived. Excavations in recent years under the direction of Eilat Mazar, have unearthed numerous finds associated with the structure, which she believes was constructed in the early 10th century BCE. Based on clues from the Bible regarding the location of David’s house, and on stately architectural elements founds in a nearby landslide, it was suggested that this may have been King David’s palace. 2 bullae (clay impressions used for sealing documents) belonging to high-ranking officials in the court of King Zedekiah, the last King of Judah, were found in relation to the structure. The city shall be rebuilt on its mound, and the fortress in its proper place. Many of the homes of ancient Jerusalem were built on this slope. The nature of these dwellings and the remains found within them, show that during the 1st Temple period this was a residential quarter inhabited by notables and royal officials. This quarter, together with the rest of Jerusalem, was destroyed by the Babylonians in 586 BCE. In the first part of the 2nd Temple period, a new city wall was built at the top of this area, leaving the earlier ruins outside the city limits. The impressive stepped structure uncovered at the top of this area served as part of a large retaining wall. Scholars are divided as to the date of its construction. Some contend it was built in the 13-12th centuries BCE as part of the foundation of the Canaanite Fortress of Zion, conquered by David, while others believe it supported David’s palace. Below the steps is a house, which, according to potsherds found in the ruins, may have belonged to Ahiel. The house is a typical 4-roomed 1st Temple period dwelling. To the right of the building is a stone toilet seat, set over a pit. The presence of a toilet near the dwelling reflects the elevated status of its residents. To the right of the house is a room that was burnt and collapsed in the fire that consumed Jerusalem in 586 BCE, after it was conquered by the Babylonians. The floor of the room was covered in a thick layer of ash, underneath which excavators found numerous arrowheads and the remains of wooden furniture. The furniture, made of wood imported from Syria, is another sign of the elevated status of the inhabitants. Remains of an archive, known as the “House of the Bullae”, were unearthed in the lower section of the site. The building that housed the archive and its contents were destroyed in the fire, together with the entire quarter. 51 bullae, hardened and preserved by the fire, were discovered by archaeologist Yigal Shiloh during his excavations in 1978-1985. The seal impressions bear the names of people from the 1st Temple period, including some known from the Bible, such as Gemariahu, an important official in the court of King Jehoiakim. 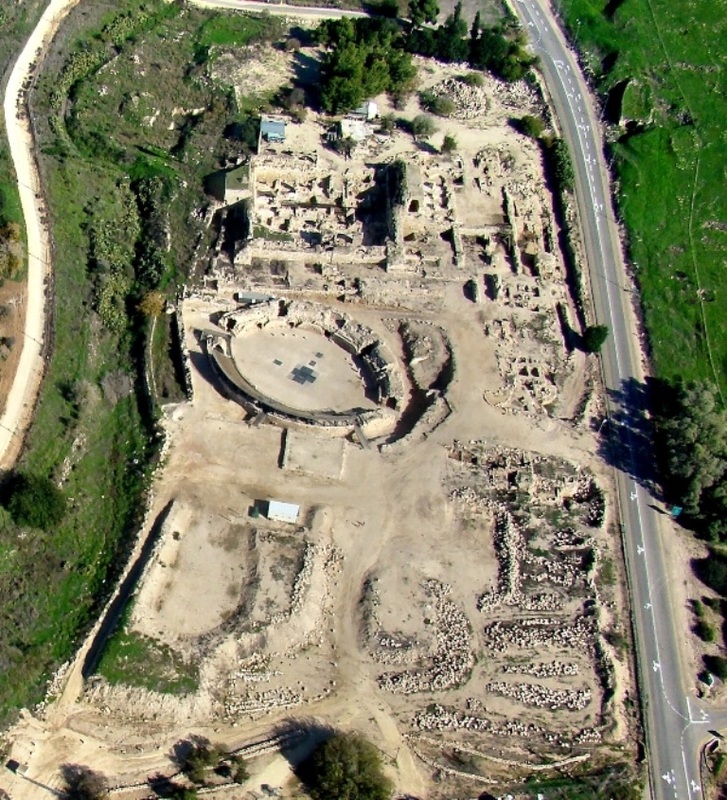 To the right of the stepped structure once stood a large stone tower (dismantled by the archeologists), which was built in Nehemiah’s time in the mid-5th century BCE. The small section of wall that can be seen also becomes to this period. 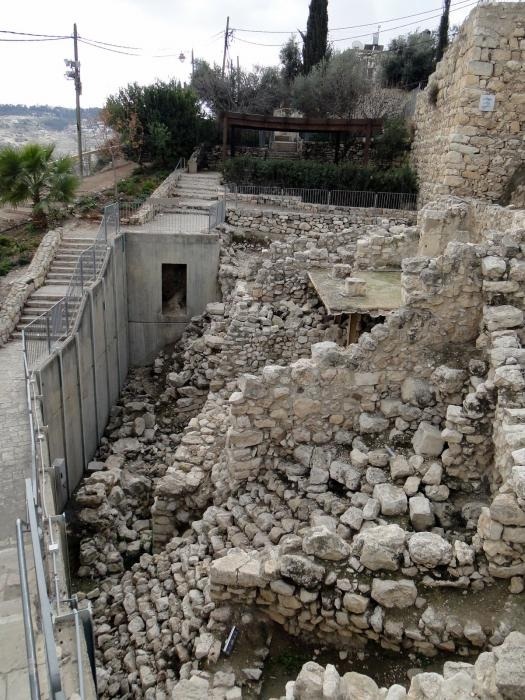 Nehemiah is believed to have constructed the wall here at the top of the slope because piles of debris from the Babylonian destruction made it impossible to rebuild along the original line. This promenade gives a comprehensive view of Jerusalem to the north, including the Temple Mount. This may have been the direction from which Abraham first viewed the Moriah Mount (now the Temple Mount). Below, on the right, is Jabel Malcaba. Opposite is the Augusta Victoria church (Lutheran) and hospital. This was the original home of the first British High Commissioner in Palestine, Sir Herbert Samuel, after his arrival in 1920. In 1927 there was an earthquake and the Governor’s residence was temporarily moved to Beit Machanaim, after which the official residence to the right of the promenade was built. Today the building is the local UN headquarters. Moving left is the Hebrew University Tower, the Mormon University and French Hill. Below Augusta Victoria, on the right is Har Mamashit (Mount of Offence). Below this is the Arab village of Silwan, which is where the first Yemenite Jews to immigrate to Israel lived in the 19th century. Below Augusta Victoria, on the left, is the Church of Viri Galilaei. Further left, the Maria Magdelena Church, with its gold onion domes, can be seen. In front, at the bottom of the valley is the Kidron Stream, and the south wall of the Old City is to the left. 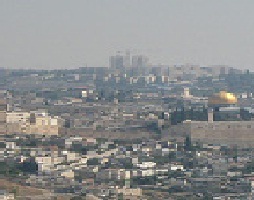 The Dome of the Rock and El Aksa mosques can be seen on the Temple Mount. In front of the Old City is the City of David. The white dome seen in the distance if the dome of the rebuilt Hurva Synagogue, in the Jewish Quarter. Also in this direction are the Domitzio Building and the Casa Nova Tower of the Franciscan monastery. Below it is Har Zion. In front, to the right is Abu Tor and on the left in the distance is the King David Hotel, with the Crowne Plaza hotel further to the left. Beit Guvrin replaced Maresha as the most important settlement in the area. It is mentioned for the first time in 68 CE in writing by Josephus Flavius, as one of the towns conquered by the Roman general Vespasian. Following the destruction of the 2nd Temple, it continued to exist as a rather crowded Jewish settlement until the Bar-Kochva revolt in 132-135 CE. In 200, Emperor Septimus Severus changed Beit Guvrin’s name to Eleutheropolis (City of the Free) and granted it Polis (municipal) status. 2 aqueducts brought water from afar, which, together with local waterworks, supplied the requirements of the residents. 5 highways, all marked with milstones, led to the city from various directions. Besides dwellings, the city boasted an amphitheatre and public buildings. The Jewish settlement was rehabilitated and in the 3rd-4th centuries Beit Guvrin was mentioned in the Talmud and Midrashim by sages such as Rabbi Yonatan and Rabbi Yehuda Ben-Yaakov. A large Jewish cemetery and architectural remains from the Roman and Byzantine periods have been found. During the Byzantine period, Beit Guvrin was an important centre of Christianity, with a number of churches. Most of the bells caves are from the Early Muslim period, and finds from the Crusader period indicate that it was a small, fortified city, at the hub of which was a church dedicated in 1136. The city was surrounded by Crusader villages, and it appears the Church of St. Anne was restored about the same time. An Arab village occupied the site until the War of Independence. In June 1948 the Egyptian Army occupied the British Taggart Fort there and on 27.10.48 Israeli forces recovered the area. In May 1948 Kibbutz Beit Guvrin was established. A series of 80 large caves from the Byzantine and Early Moslem periods, which the inhabitants connected by passageways. The caves, the largest of which are over 5 meters high, were dug into the hard surface rock and quarried downward in the shape of a bell. At first it was thought that the caves were used a water cisterns, storehouses, dwellings and bunkers. Today, however, it is clear that most of them were quarries, which supplied the building materials for cities of the coastal plain and Bet-Guvrin itself. The stone blocks were raised and removed from the caves by means of ropes. Arabic inscriptions and crosses found on the walls show that many of the caves were dug during the Early Arab period, in the seventh-tenth centuries CE. This amphitheater, which has a capacity of 3,500, was used for fights between gladiators, slaves and wild animals, to entertain the masses. The floor of the arena (a Latin word meaning sand) was covered in sand to absorb the split blood. 2 crossing tunnels under the arena probably served as cages for the animals, who were brought up to the arena by elevator. The shows were free to Roman citizens. In the Byzantine period the amphitheater served as a public market. Parts of a large Roman bathhouse were discovered east of the amphitheater. It includes several impressive arches and the “Cauldron” (hot room). In the 12th century a large Crusader fortress, surrounded by a moat, was built on top of the amphitheatre and the bathhouse. In the centre was an inner fort with several arches and a mess hall. Attached to the south of the fortress is a church with 2 rows of columns and 3 niches. Several structures were added to the inner fort in the Mamluk and Ottoman eras, including a mosque. Bet Guvrin-Maresha National Park encompasses approximately 5,000 dunams (1,250 acres) of rolling hills in the Judean Lowlands. The hills, approximately 400 m above sea level, consist mainly of chalk overlaid with harder rock called nari about 1.5-2 metres deep. For thousands of years people have been cutting into the rock beneath the nari as quarries, burial caves, storerooms, industrial facilities, hideouts and dovecotes. They dug small openings into the nari and expanded the caves into the softer chalk beneath. 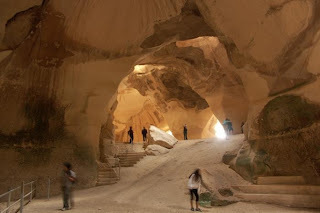 Hundreds of such caves were dug at Bet Guvrin and its surroundings, creating subterranean networks of great complexity. At a high point in the park is Tel Maresha, the highest city in the Judean Lowlands. It was fortified by King Rehoboam of Judah following the campaign to the region of the Egyptian Pharaoh Shishak. It was abandoned after the destruction of the First Temple in 586 BCE, when the Jews left for Babylon. The city was resettled and reached its height during the Hellenistic period (third-second centuries BCE), when it was inhabited by the Edomites. The Hasmonean king, Yochanan Hycanus conquered the city in the second century BCE and forcibly converted its inhabitants it Judaism. During the Roman period the inhabitants of Maresha abandoned it, building the city of Bet Guvrin nearby and transforming the latter into the capital of the region of western Idumea. Tel Maresha was found by archeologists Bliss and Maclister of the British Exploration Fund in 1900. The Ottoman Turks allowed them to excavate several tells in the area on condition they returned everything to its former state afterwards. This cave was dug during the 4th-3rd centures BCE and may have originally been a quarry. It was later converted to a columbarium for raising pigeons. During World War II it was visited by Polish soldiers from the Free Polish Army. They engraved the year of their visit, 1943, the words “Warsaw, Poland” and the eagle symbol of the Polish Army into one of the supporting pillars. This was built in the shape of a double cross and is the largest in the country. It has more than 2,000 niches. The blue colour which can be seen is a bacteria called Cianobacteria, which develops where there is a small amount of light and a lot of moisture. The pigeons raised were used for food and fertilizer. The columbarium went out of use at the end of the 3rd century BCE and the niches were used for storage. 85 such columbaria were found in the area, with tens of thousands of niches. This comprises of a flight of stairs and 2 small rooms with seats for the bathers, who showered in jets of water emerging from the bedrock wall. The bather was invisible to the slave pouring the water. At least 20 such bathing caves have been found in Maresha. This is one of 22 subterranean olive oil plants from the 4th-3rd centuries BCE, discovered so far at Maresha. In most of them there is one crushing installation and 2 or 3 lever-and-weights presses for extracting the oil from the olive mash. Growing olives and producing oil was an important part of the economy of the area in ancient times. The olives were harvested in the autumn and the plants worked around the clock for the next 2-3 months producing oil. The house, partly reconstructed, was used as a dwelling and for trade during the Hellenistic period The ground floor occupies about 1,600 square feet and its rooms were arranged around a small central courtyard. Ascent to the 2nd floor was by a flight of stairs. The walls of the house survived to a height of 5 feet. They were plastered to preserve the soft limestone. Under the floor of one of the rooms 25 coins were discovered, with the latest dated 113 BCE. The house was probably destroyed that year when Maresha was conquered by the Maccabees. There are cisterns underneath the house in which rainwater, collected from the alleys, roofs and courtyards, was stored. It flowed through ceramic pipes along the length of the stairs. These are from the Hellenistic period. Through the northern house one may descend to a bath, remarkable in both its design and state of preservation. The underground route leads to a group of cisterns, continuing through the columbarium to additional rooms and cisterns. The olive oil plant and its adjacent changers are underneath the fourth and last house. In the past, the many underground chambers were used separately, there was no passageway connecting them. 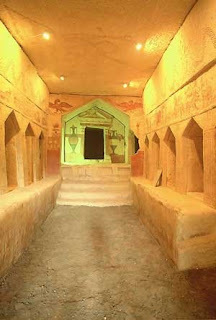 A series of impressive burial caves from the Hellenistic period, located at the foot of Tel Maresha and featuring reconstructed wall paintings. The caves were rediscovered by archaelogists Thirsch and Piters in 1902. Initial burial was in niches around the walls, which could be sealed with stones so there would be no smell. After a year the bones were removed to a central room. The paintings, proof of the presence of other cultures at Maresha, depict hunting scenes with wild and mythological creatures and shed light on ancient artistic techniques and crafts. 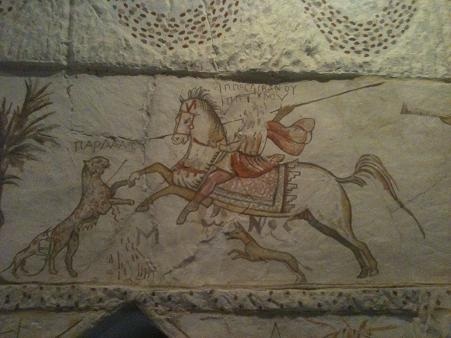 The paintings were restored in 1993 from sketches done after the caves were discovered.